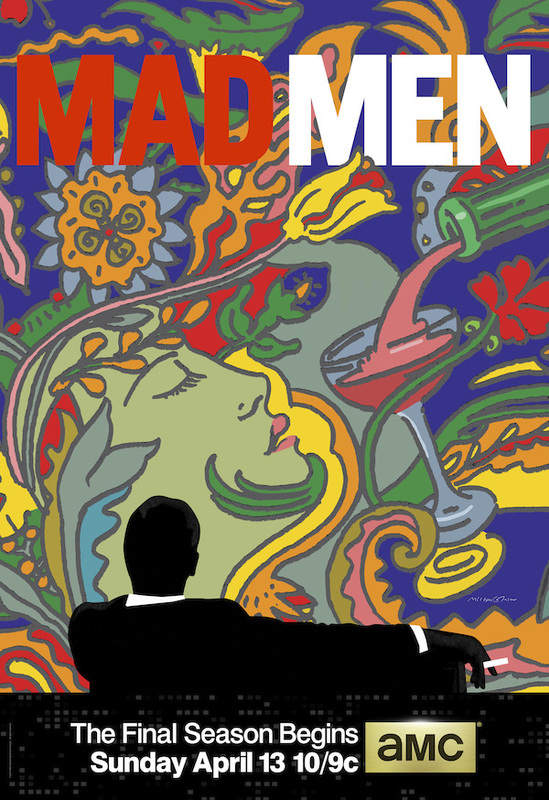 Mad Men Reveals Season 7 Key Art: Who Is Milton Glaser? So, AMC has gotten the ball rolling on the Mad Men season seven promotional onslaught! Yesterday’s wordless 15-second teaser was one thing, and today we have the key art. It’s a decidedly bright departure from the typical fare, featuring the work of popular graphic designer of the 50s and 60s named Milton Glaser. And it’s no accident that the series’ creator, Matthew Weiner, chose this particular artist to craft the poster’s colorful artwork. Don’t know who he is? You do — or at least his work — you just don’t realize it! Glaser is most well-known for creating the I <3 NY tourism campaign — you know, just one of the most iconic images of all time? Classic Glaser! But that’s not even the short list of his myriad accomplishments. The artist has a penchant for logo design and also created the DC Comics logo the company used from 1977 to 2005, and Brooklyn Brewery’s as well. Another image you may well be familiar with of his is the swirling, colorful cover of Bob Dylan’s greatest hits album from 1967 — seen here — that showcases his colorful and fanciful aesthetic. From film, to art, to corporations, and everywhere in between — Glaser’s work is that of a man with a distinct point of view that’s also incredibly flexible and resilient. Having stood the test of time for four decades, it’s no wonder Weiner has taken so strongly to the man’s work. Could Don Draper’s work ever become as identifiable as Glaser’s? Glaser’s work is housed in the permanent collections of such impressive art houses as the Museum of Modern Art in New York in addition to the National Archive, and the Smithsonian in Washington, D.C. Weiner has previously stated that he grew up with a poster of Glaser’s work in his childhood home — making working with him the fulfillment of a lifelong dream. But that’s only just the artistic side of Glaser. He’s also incredibly accomplished in the media world. Ever heard of a little publication called New York Magazine? Yeah, you have Glaser, in part, to thank for that, too. In 1968, Glaser and Clay Felker founded New York Magazine together, where Glaser became president and design director until 1977. Truly, Glaser’s swirling and iconic designs, coupled with his business acumen, make him the ultimate renaissance man of the 50s and 60s. Mad Men returns for its final, two-part seventh season on Sunday, April 13th at 10PM on AMC.